The post Test Tube Snow Globe Ornaments appeared first on Mama.Papa.Bubba.. The new report from the United Nations Educational, Scientific, and Cultural Organization makes the argument that the current immigration policies of the U.S. government create too many barriers for students who are immigrants or refugees. Where do you buy the giant white beans? Democrats in Congress are pushing legislation to help increase the skills and knowledge of teachers who work with English-learners, including how to identify and teach ELLs with disabilities and how to promote family and community engagement. I make a lot of trousers, but somehow there’s always room for more, especially of the statement-y and elasticated-waist variety. 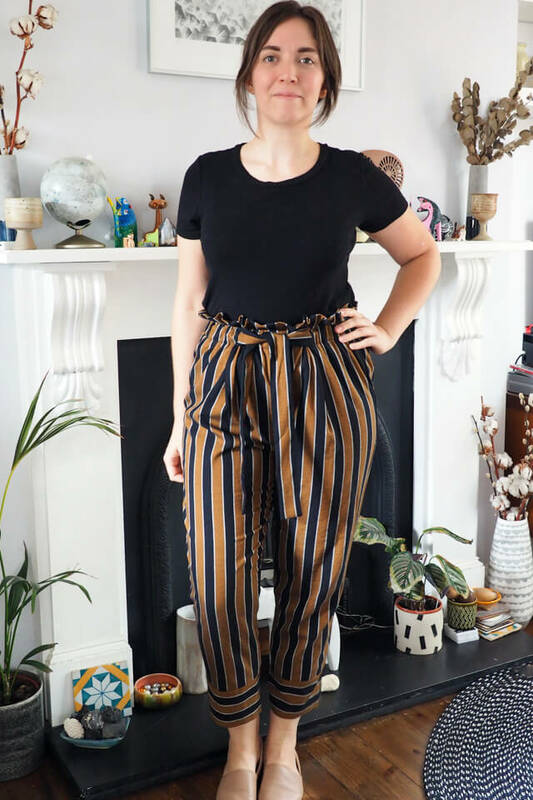 I think these Style Arc Tully pants fit the bill nicely! 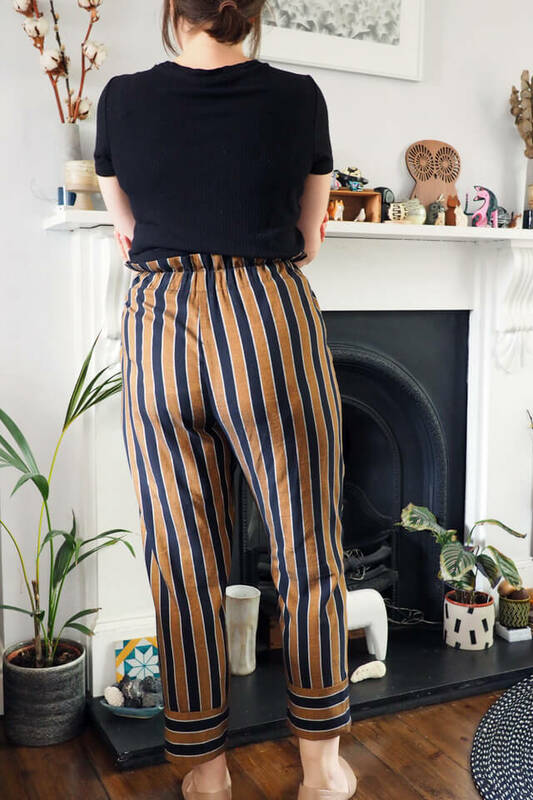 The Tully pattern is designed with striped fabric in mind, as there’s a chance to play with the direction on the ties and cuffs; stripe direction lines are marked on the pattern pieces. 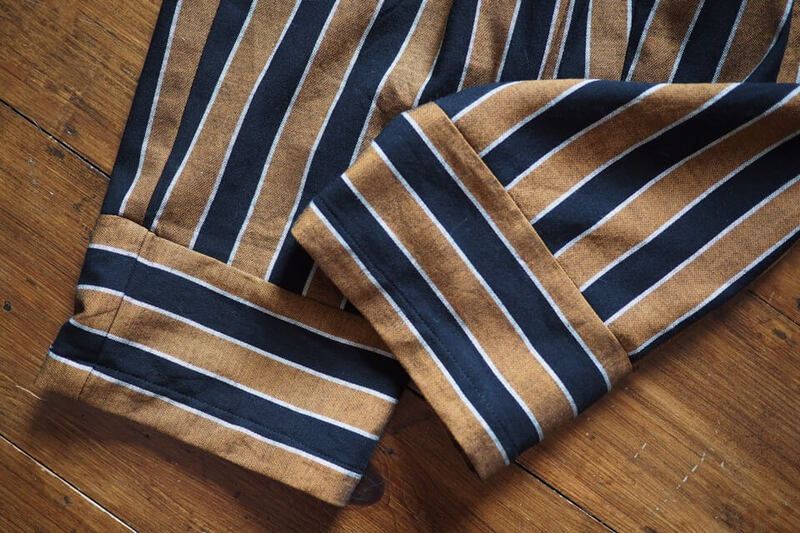 I bought this yarn-dyed cotton-viscose from Stoff & Stil with exactly this project in mind. It’s a great fabric, slightly beefier than a normal dress viscose so perfect for pants. 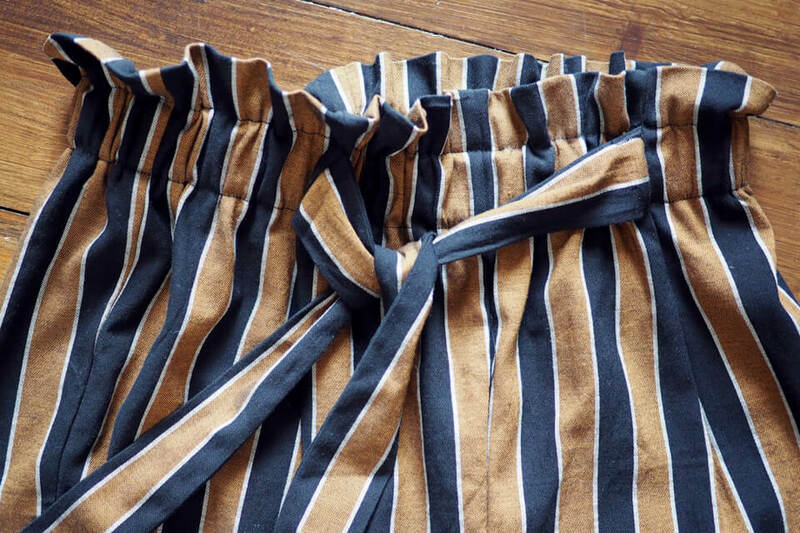 I used the wrong side of the fabric as the orange stripes are slightly darker and I preferred the more subtle look. It frayed like crazy so all seams are overlocked. Oh, and this pattern only takes 1.5m of fabric and it’s very efficient to cut, so very little is wasted – always a bonus! The pattern was fun to put together and much more simple than it looks, even with SA’s famously brief instructions. 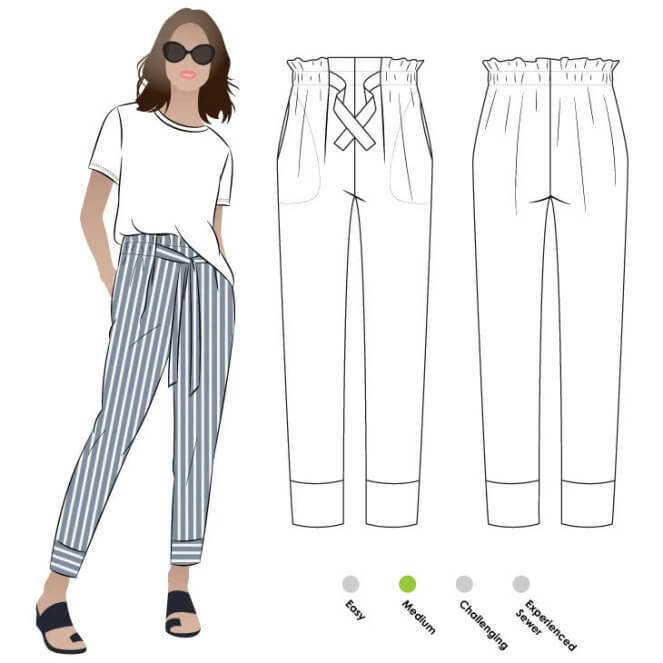 There are diagrams that clearly explain how to form the waistline, and I think the front pleat with the ties wedged into it is such a cool yet easy to sew detail. 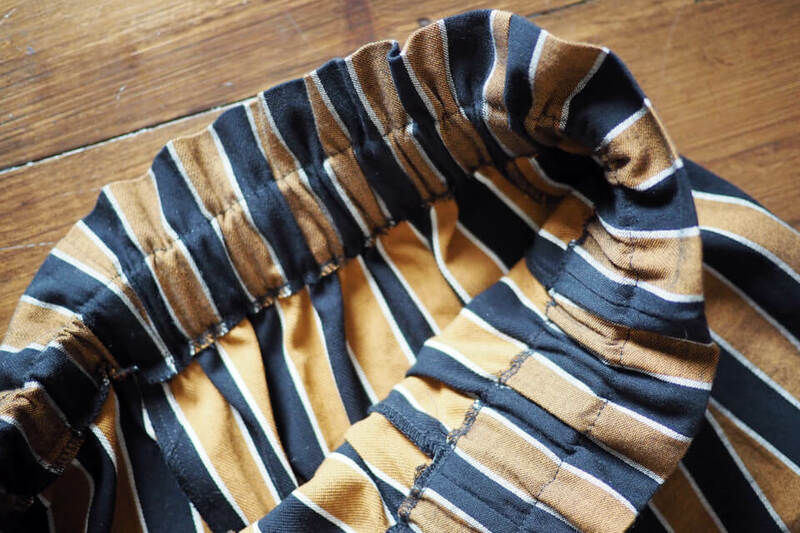 That said, I supplemented the instructions with a few extra steps, like pressing a crease into the paperbag waist edge before sewing up the crotch seam so it’d be easier to re-fold into place later, and seam finishes are not considered at all so I had to overlock as I went. I also continued the elastic across the centre front rather than ending it at the ties, as I preferred the ties to cinch a little closer together. I cut out the side seam pocket pieces but then forgot-slash-decided to leave them out: the lack of pockets is already annoying me though and while it’s not possible to do my preferred slash pockets due to the waistline construction, I think there might be a way to add side seam pockets and anchor them into the top seam to prevent them flapping about. I’ll either go back and add them to these or consider this for my next pair. Lander-style patch pockets would be another option to explore. Unusually for me I hardly messed with the design or fit at all other than the noted above. The hip has plenty of ease and the waist is elasticated so no need for much fine-tuning. 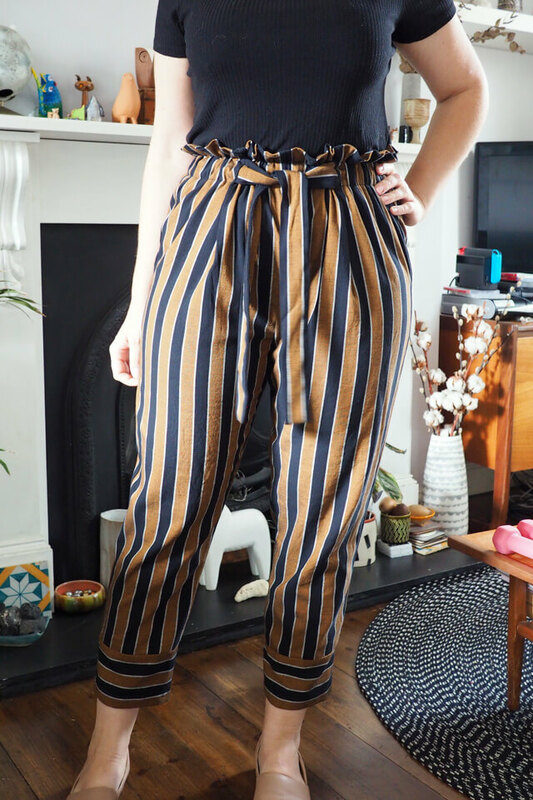 I only had to take a slightly larger seam and hem allowance on the leg cuffs to get the “7/8” length look as intended on my rather short legs, therefore a longer-legged person might find they come up much shorter than intended. 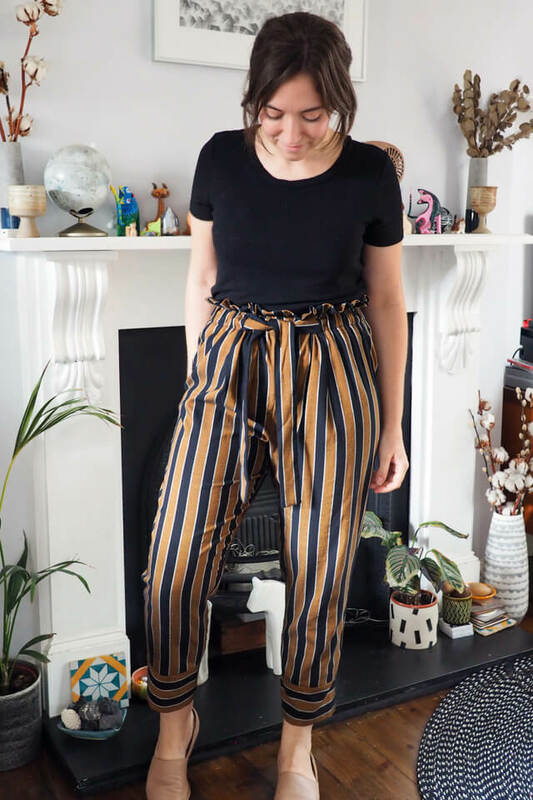 The fabric and slightly directional design detail of the waist make these at the upper end of statement-making for my tastes, but the comfort and colours make them supremely wearable. I’m definitely going to make another pair in a solid colour, either black or forest green. This looks great and I’m going to try it (next Southern Hemisphere summer). When I make peach jam, I use only half as much sugar as fruit but usually keep it in the fridge. I macerate my fruit in the sugar over night, before cooking, as I find it draws out extra flavour. I made these with some homemade rhubarb filling (because summer in Alaska is a constant battle to use rhubarb in everything!) and it was perfect. In case anyone else wants to give it a shot, I also made the dough in a bread machine because it’s always too cool here to get a good rise at room temperature. It worked splendidly! I mixed the sugar, yeast, and milk in a measuring cup and let rest for five minutes, then poured them into the bread machine bowl. I added the rest of the wet ingredients, then the flour, then the salt on top. This looks so yum! Can I substitute yogurt for the mayonnaise? Despite their concerns, the U.S. Department of Education seems ready to forge ahead with plans to scrap the office of English-language acquisition. Working with kids is a lot of work, but also a lot of fun. Life Pro Tip: Make sure your kids eat breakfast before sending them to us!